Midhurst looked like bagging a valuable win when they made the long trip to East Sussex – only to be denied by a 102nd-minute equaliser. The hosts were the dominant side for the opening 30 minutes and took a deserved lead on 13 minutes as Jack Webber skipped past two challenges and calmly beat keeper Josh Bird. Before the hosts doubled their lead Josh Sheehan and Jake Slater both had chances to pull the Stags level with Sheehan hitting the bar and Slater just firing over. The hosts doubled the lead on 30 minutes. Again Webber got free and was left one on one with Bird and slotted home easily. This rocked the Stags back as the hosts forced Bird into a routine stop and put another wide when easier to score. Midhurst gradually worked themselves back into the game and in the remaining ten minutes of the half improved. Gary Norgate got free from his marker and headed home from a corner to pull a goal back for the Stags. Two minutes before the break a good delivery from Sheehan on the right found Slater, who smashed home a volley from ten yards giving Jack Webb in the hosts’ goal no chance. After the interval the Stags looked a more compact side and took control of the game. The only time the hosts got into a dangerous area, they felt they should have had a penalty when Chris Wyatt went up for a header and looked like he gave a forward a nudge in the back, but the referee waved away the protests. The Stags took the lead in the 75th minute when Sheehan played a good ball to Liam Dreckmann who raced through and slotted home. Minutes later Dreckmann got tangled up with the home full-back and received his second booking and was dismissed. Midhurst were defending well wit ten men and the hosts were not asking questions of Bird in the Stags goal. 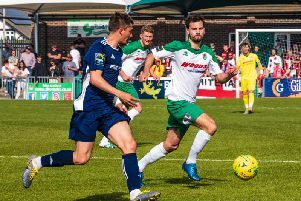 Time was ticking away and Seaford started pushing more and in the 12th minute of stoppage time, a corner was swung in, half cleared and the loose ball was poked home by Alexander Saunders to deny the Stags all three points.